Your Firefox browser guide. Download it now! I have been a long time internet user. It started a decade ago with Lynx and the early Netscape Navigators, I switched to Internet Explorer 4 when the Netscape suite was getting too bloated for my taste, then took a pleasant risk and downloaded Opera, but it was still displaying commercial banners at the time, after which the open source Mozilla browser 1.0 had become mature enough and I fell back into comfortable shoes. All the features I wanted as a sophisticated web surfer was there, however, fussy as I am, I felt they still couldn't manage to make a lean, fast, and light piece of software in addition of offering those advanced features. That's when a new Mozilla fork appeared and I never looked back since: Mozilla Firefox. This free, cross platform browser has got it all: it's user friendly, mainstream product usable by the average joe, which means serious web sites like banks will not ignore it and force that segment of users into switching to Microsoft Internet Explorer for their operations, it is lightweight, fast, secure, and it contains advanced features and personal customizations for the power users out there. Firefox is very focused toward a better user experience: it has tabbed browsing, making it easier to open many windows without cluttering your desktop, and pop-ups blockers against those annoying ads that open windows without the user's consent, with a good chance of finally crashing the whole browser down. Its Find function with the "find as you go" behavior makes it a breeze to scan a page for specific keywords. It is an open source project with a big community of enthusiasts throwing their talent and creativity into making original and practical extensions that could meet almost any exotic demands from any user. Many of those features would never be provided by other browser makers because they are not corporate friendly, such as ads blockers. Being open source is not the end of its qualities, Firefox also is very standard compliant, so web developers can count on it for adhering to the latest W3C guidelines, which makes their work easier and insures future compatibility with the present web sites. Hopefully, one day, the laggard Microsoft browser will catch up to Firefox (and Opera, and Safari...) and web site developers won't have to program for different browsers anymore, just one industrial standard. Firefox has also a great reputation for on-line security. Because that browser is not intrinsically tight up deep within the operating system, like Internet Explorer, it provides by default a certain layer of protection to your computer. At worse, only that particular application can become problematic, which hasn't happened yet. Their lower market share also makes it a less interesting target for virus creators and other hackers. The auto update feature will make sure you are always up to date with the latest patch at the click of a button. Regarding your privacy, Firefox makes it very easy to erase all traces of your browsing activities with a simple click, if you so desired, such as cookies, internet cache files, browsing history, download history, and more. 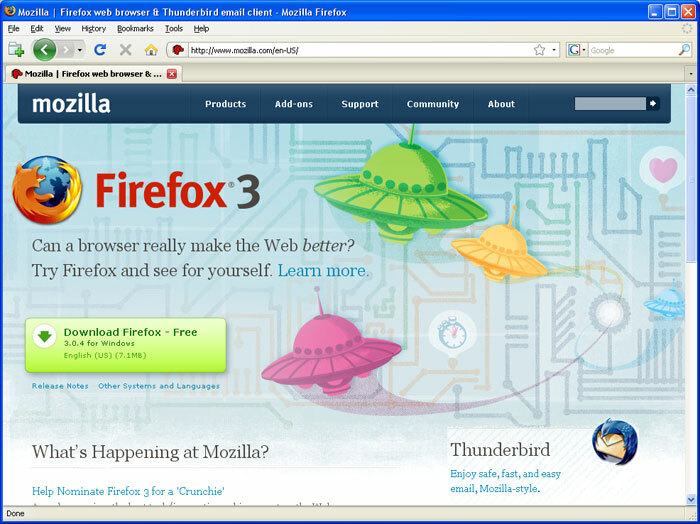 Firefox was such a success that the initial side project became the main flagship product for the Mozilla organization. Mozilla and Firefox are registered trademarks of Mozilla. BrowserFirefox.com is not officially affiliated with Mozilla Firefox.